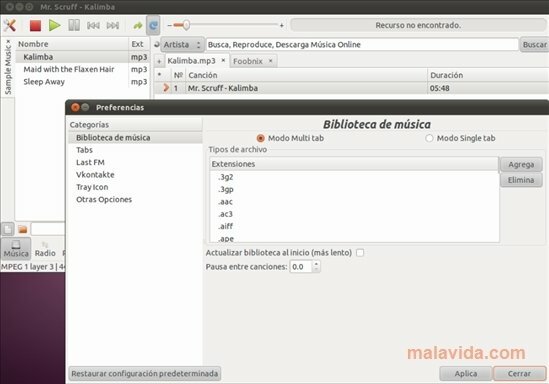 Foobnix is a music player, music search engine and online radio station player specially designed for GNU/Linux environments. Its many options are a real advantage for the user, as it brings together in a single application a series of tools that are usually distributed separately. Lightweight and functional music player for Linux. Incorporates 3,500 different radio stations. Search for lyrics and information about them. Its graphical interface includes a useful equalizer, as well as allowing you to browse through filters and to play videos. A very detailed and at the same time original appearance makes Foobnix a complete application, a great alternative for Linux users that are looking for an all-terrain music player. Only compatible with 32-bit systems. Only compatible with systems based on Ubuntu/Debian.